I usually get sick most of the winter. I think my wife called it cabin fever, and then she said it turned into spring fever. I still think it’s just a bug, maybe that RV bug that’s going around. Football and the Steelers winning the Super Bowl helps me feel a little better, but now that the season is over I had a relapse. My wife asked me if there was anything that would make me feel better. I told her I would probably feel a little better if we went to the local RV show that was coming up. I went on to explain that I could probably get over this bug completely if we nail down a date and planned our first RV trip for 2009. Our motor home has been sitting idle since last Thanksgiving. We normally use it year round, but for one reason or another it didn’t work out this winter. Occasionally I go out to the motor home and just tinker around a bit. It just make me feel better. A few days ago my twelve-year-old son wanted to play monopoly. I told him it was in the motor home. When he came back in the house with the game he said, “ Dad, when are we going to use the motor home? When I walked inside to get the game I just made me want to go camping.” I explained to him that he has the bug, but he will be better soon because we are planning to take a trip. Last week I decided it was safe to de-winterize the motor home and do my annual spring preparation. 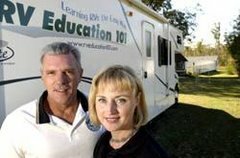 I am enclosing a checklist from my “Checklists for RVers” e-book for those of you that have the bug and want to get your RV ready for its first trip of the season. The only thing left to do is figure out where our first RV adventure of 2009 will take us. One good thing about the RV bug is you might feel sick for a while, but you get over it as soon at you pull out of the driveway. After a long winter sleep we finally decide that spring is on its way and it is safe to prep our RV for this years camping season. Now that the decision is made we need to figure out what steps to take to prepare the coach and the chassis for camping and traveling. If you’re like me, you want to have some type of logical sequence to follow rather then haphazardly checking the unit out. This is a simple checklist to use so that nothing is overlooked. I prefer to do the majority of spring preparation myself. 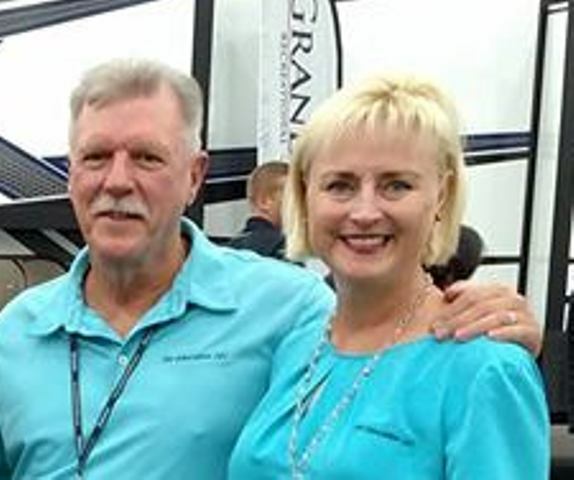 If you are more comfortable having someone else do it contact a reputable RV dealer and schedule an appointment to have it done. ■Inspect for water leaks. A quick and easy way to test your RV plumbing system for leaks is to turn the 12-volt water pump on when there is water in the fresh water holding tank. Once it pressurizes the system and shuts off it should not come back on until you open a water faucet. If the pump does come on sporadically, even for short periods of time, water is leaking somewhere. ■Check the operation of the toilet. ■Remove any protective covering that may have put over LP gas vents or outside vents to keep insects or rodents out. Check any mousetraps you may have put out. Open all doors and compartments and check for rodent intrusion and water damage. ■Wash the unit thoroughly. This is a good time to inspect the roof and body seams, and window sealant for cracking that would allow water to get in. Consult a dealer for sealants compatible with these materials. ■Inspect the operation of the awning and check the awning fabric. Clean the fabric and let it dry thoroughly before rolling up. ■Inspect the tires for signs of dry rot and wear. Inflate all tires to the recommended COLD tire pressure. ■Check the lug nuts for proper torque. ■Lubricate all hinges and locks with a spray lubricant. ■Inspect and clean the RV’s interior. ■Plug in any appliances that you unplugged for storage and replace any dry cell batteries you may have removed. This is a good time to put new batteries in items like smoke alarms. ■Test the operation of the carbon monoxide alarm, LP gas leak detector and smoke alarm. ■Check the fire extinguisher. Be sure it is fully charged. ■Reset any breakers you may have turned off. If you removed any fuses for storage re-install them. ■Clean or replace air conditioner filters if it wasn’t done prior to storage and remove any covers that were put over air conditioners. ■Open vents and windows and air the unit out. ■If you removed the coach and chassis batteries for storage install them. Whether they were removed or not check the electrolyte levels, clean the terminals and clamps, and check the charge level in all batteries. Recharge batteries as necessary. ■Check the operation of the electric steps if applicable. Lubricate step mechanism. ■Test the operation of the hydraulic jacks if applicable. Check hydraulic fluid level if applicable. ■Test the operation of the back up camera and monitor if applicable. ■If you didn’t change the oil and filters in the generator prior to storage this is a good time to do it. ■Inspect the generator exhaust system for damage prior to starting. Start and run the generator for one hour with at least a half rated load on it. Consult the generators owner manual for load ratings. ■Turn the generator off and plug the unit into shore power. Turn the refrigerator on in the electric mode. Allow sufficient time to cool and check for proper operation. ■Check all 12-volt interior lights and accessories. ■Test the monitor panel for proper operation. ■Check the operation of slide outs if applicable. ■Check the remaining 120-volt appliances for proper operation. ■Test the Ground Fault Circuit Interrupter (GFCI) for proper operation. ■Turn the refrigerator off, leave the doors open and allow sufficient time for it to get to room temperature so it can be checked in the gas mode. ■Before I use the LP gas system I have a leak test and gas operating pressure test preformed. A qualified technician with the proper equipment should do these tests. ■Once this is accomplished turn the LP gas valve on and check the operation of all LP gas appliances. Be sure the water heater is full of water before testing the water heater. 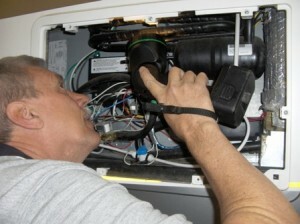 If a gas appliance is not operating properly have it inspected by a qualified technician. Insects are attracted to the odorant added to LP gas and build nests that can affect the appliance from operating properly. ■If your unit was in long-term storage and you didn’t change the engine oil and filter prior to storage this would be a good time to do it. ■Check all fluid levels in transmission, power steering, engine coolant, windshield washer and brakes. Consult vehicle owner’s manual. ■Start engine and check for proper readings on all gauges. Check for proper operation of dash air conditioner. ■A full chassis lubrication should be preformed if it wasn’t done prior to storage. ■Check the condition of windshield wiper blades replace if necessary. ■Check the operation of all chassis lights. ■Check to see that your inspection / emissions sticker is up to date. ■In addition to this if you have a pop up or travel trailer the wheel bearings and brakes (if equipped) should be inspected at least once annually. Inspect any canvas for dry rot and tears; inspect all hitch work and coupler for damage. Inspect the breakaway switch and pigtail for proper operation. This list is not all-inclusive, but it seems to work for me. Now for the fun part, load your clothes, food, and personal belongings, hit the road and have fun exploring this wonderful country we live in. This checklist is an excerpt from my Checklists for RVers e-book.